Wine contains a plant-derived chemical, called resveratrol, which may help burn belly fat and decrease inflammation commonly associated with obesity. Excessive abdominal fat can increase the risk of heart-related conditions, and the resveratrol in wine may not only reduce abdominal fat, but may also help prevent heart disease. The resveratrol in a glass of wine may aid in your fight against belly fat. Consult your doctor before increasing any alcohol intake; researchers recommend against increasing your current level of alcohol consumption in an effort to reap health benefits. Your body utilizes fat stored in your belly, or omentum fat, differently from fat stored in other parts of your body. Abdominal fat travels hastily to the liver for processing and is then transported directly into your arteries. Too much omentum fat can increase your risk of health-related conditions such as high levels of low-density-lipoprotein cholesterol — the dangerous type of cholesterol, Dr. Michael F. Roizen warns on the Sharecare website. An abundance of abdominal fat also results in the secretion of minimal amounts of the chemical adiponectin, which fights inflammation, plays a role in controlling hunger and helps regulate belly fat. In contrast, less belly fat produces more adiponectin and results in less inflammation and body fat. Thus, people with large bellies and subsequent low levels of adiponectin face an increased risk of abdominal obesity and heart-related health issues. The amount of wine you drink and how often you drink may play a role in the amount of belly fat you accumulate. Research published in the August 2003 edition of the “Journal of Nutrition” observed the effects of drinking patterns on abdominal fat accumulation in 2,343 men and women. Researchers assessed various alcoholic beverage types, quantities consumed and frequency of consumption. Wine drinkers who drank at least one drink daily exhibited the lowest amount of abdominal height — the amount of abdominal extension above the torso when lying down. Abdominal height also decreased in participants consuming increasing amounts of wine consistently. Meanwhile, hard liquor drinkers drinking four or more drinks daily, on a less-than-weekly basis, exhibited the largest abdominal height. Resveratrol, a product of the wine-making process, comes from the skin of grapes. Both red and white wines contain resveratrol; red wine contains more than white wine, because red wine ferments for a longer time with the grape skins. Research published in the May 2011 edition of the “The Journal of Nutritional Biochemistry” evaluated the effects of a powder form of resveratrol on fat metabolism in human and mice cells. According to researchers, overall results provided evidence that resveratrol regulates fat burning, or lipolytic, activity in human and mice fat cells as well as in the white fat tissues of mice. 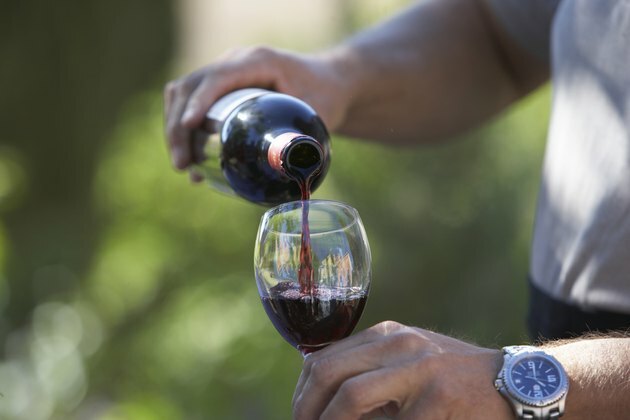 The resveratrol in wine may regulate fat-secreted proteins that can increase low-grade inflammation associated with increased belly fat and obesity. Adipokines, which include adiponectin, can be anti-inflammatory or pro-inflammatory. Research published in the “International Journal of Obesity” in October 2010 explored the anti-inflammatory effects of resveratrol on human adipose, or fat cell, tissue. Among other findings, researchers discovered that resveratrol reversed an induced secretion of pro-inflammatory adipokines by 16 to 30 percent. Additionally, researchers concluded that resveratrol may benefit and improve the metabolic profile in human obesity. Sharecare; Why is Omentum Fat the Most Harmful Fat in Your Body? ; Michael Roizen, M.D. Is White Zinfandel a Healthy Wine to Drink?